I have read many biographies and had the privilege of researching and writing many stories, but none touched me like Jane Haining's. I actually felt I was within the story, living it with the heroine--sharing her passions, emotions, concerns, and fears. I felt her strong faith. The story was set in Hungary, a country that had never before taken my interest. It was the story of one woman's ultimate sacrifice for the Jews. 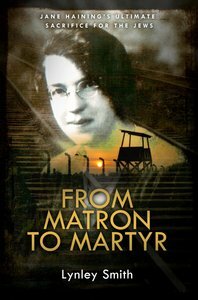 After finding a tenuous family connection to the mysterious and captivating Jane Haining, Lynley Smith crafted Jane's fictionalized diary, a biography of a faithful servant and Scottish missionary who died at the hands of Nazi butchers in Auschwitz Concentration Camp during World War II, in the inspirational and bittersweet From Matron to Martyr. Within these pages you'll discover how Jane's death has become a beacon of hope to the countless Jews of this generation who seek an answer to the big question: If the God of Abraham, Isaac, and Jacob would allow His people to experience such horrific events as the Holocaust, could He still love us? Is He a God we even want to know anymore? Read on and discover Jane's answer in Lynley Smith's From Matron to Martyr. About "From Matron to Martyr: Jane Haining's Ultimate Sacrifice For the Jews"